Amazed to see a big tub of beautiful, pristine young ginger at the Groundwork Organics stand on Saturday morning. I’ve long been dissatisfied with the preservatives in pale pink Japanese pickled ginger (gari), the Tonto to the Lone Ranger of sushi, so on the rare occasion I can find some new ginger in season, I make my own. It’s crucial not to use the fibrous, older storage-ready ginger with the beige skin, since it will be too tough (I know from experience). Instead, use the stuff that appears once a year or so in Japanese markets. AND NOW IN EUGENE, WOO! Groundwork should probably still have fresh ginger knobs for another week, judging from what they had left. Don’t hesitate. Ginger can be profitably frozen as-is. You’ll lose the texture, but the taste when grated is just a bit muted, so use a little more. I usually grate it while still frozen. The pickling solution for the following recipe is rather mild. 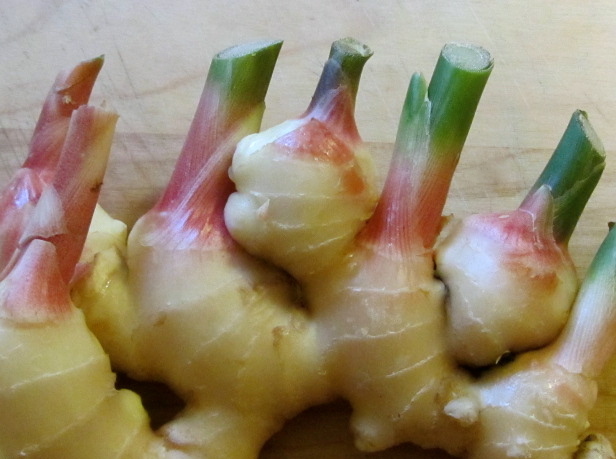 You can use this ginger as you would fresh ginger, too. I think the salt and vinegar just add a nice mild pop to the flavor. It’s great in fried rice. To achieve the pink color one sees in the commercial pickled ginger at sushi restaurants, don’t use red food coloring, as they do. Instead, add a slice of beet briefly to the pickling solution, or carefully trim the darker pink base of the stem, if you have it left on your knob of ginger, and add the trim to the top of the jar. The pink stem isn’t really edible because it’s too fibrous, so just be sure to remove it. That’s what I’m using above. Wash, trim, and rub skin off young ginger with the tip of a spoon. 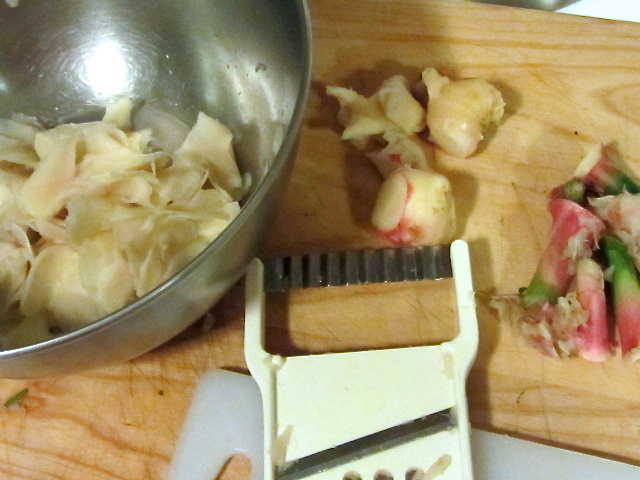 Using a mandoline or Japanese slicer, slice ginger into paper-thin bite-sized pieces. Salt the slices and let sit on the counter for an hour or so. Drain off liquid and pack in half-pint canning jar or heat-proof container. Bring rest of ingredients to a boil, then pour over ginger slices. Optional: add a slice of dark beet or the layer of dark pink ginger for color to the liquid as it boils, then discard before pouring over ginger. Let cool, then refrigerate for at least a week before using to develop flavors. Should keep for several months refrigerated. Oh I love ginger! Great idea to try to make it at home. I wonder if my local Asian markets have the young ginger right now? Have you ever considered growing your own inside? Then you would have a steady supply. It takes 9 months, but what fun! Just google Growing ginger inside and see all the helpful pages and information. 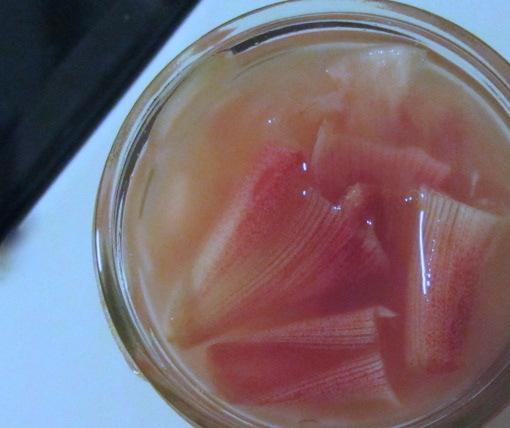 I grow Galangal; do you thinnk you could use the same pickling recipe? Having a jar or two of that in stock sounds wonderful. thanks for the recipe. I was lucky enough to also score some fresh ginger recently, and I was thrilled how the stem portions made the slices a lovely pink color. I’m going to make a Burmese ginger salad with mine. We grew our first ginger in a greenhouse this year. We planted in May and and are harvesting now. It is beautiful when compared to mature ginger. 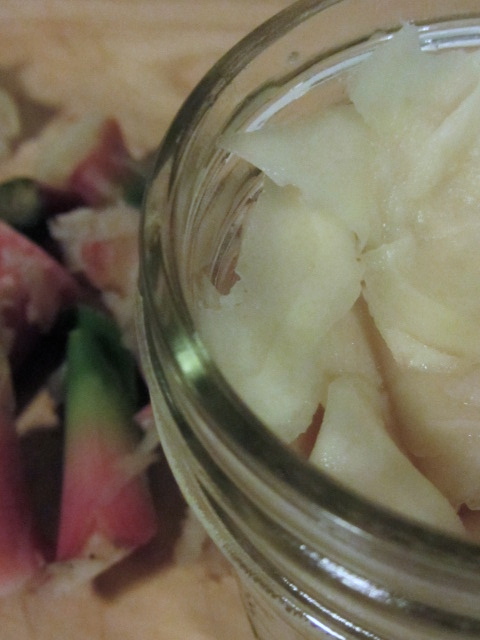 Thanks so much for the pickled ginger recipe, Jennifer. Our CSA members thank you too. You don’t need land; you can grow it at home in pots. Google growing ginger inside for help on this. Do you think this could be safely canned? I have some frozen ginger….can I now thaw and pickle it? @Gillis and @Carolyn, unfortunately, you need fresh raw ginger. There’s no reason to can it (it’s just going to be a jar or two max, and you really don’t want to make more than you can use up at once because the flavor will change over time) and if you canned it, it would have a cooked texture, quite unlike sushi gari. Texture problems would arise, too, with frozen ginger. Use that in stir-fries, not for this lovely raw tender pickle.